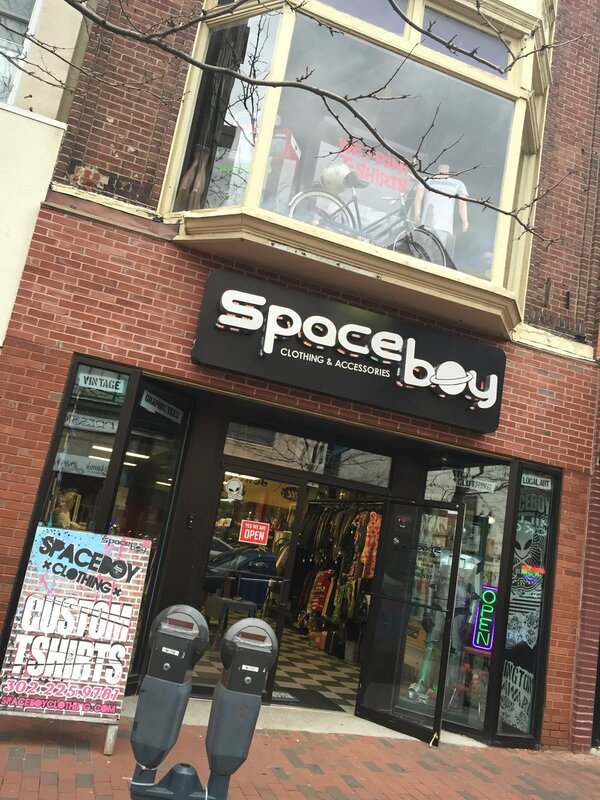 10 YEARS & BIG NEWS AT SPACEBOY!! EARLY NEXT YEAR WE WILL BE HITTING OUR 10 YEAR MARK! WE ARE VERY EXCITED TO KICK OFF 2019 AND TO CELEBRATE OUR 10 YEAR ANNIVERSARY IN THIS NEW SPACE! LOCATED ACROSS THE STREET AT 706 N. MARKET, THIS LOCATION WILL ALLOW US TO MAKE HUGE UPGRADES TO OUR STORE AND CONTINUE HOSTING LIVE MUSIC, COMEDY & ART EVENTS DOWNTOWN. PLEASE BARE WITH US DURING THE MONTH OF JANUARY, AS WE WILL BE IN THE PROCESS OF MOVING. THANKS TO EVERYONE FOR YOUR SUPPORT, PLEASE SPREAD THE WORD & BE SURE TO CHECK BACK FOR UPDATES! CAN YOU BELIEVE THIS WILL BE OUR 3RD MOVE? CHECK OUT OUR FIRST LOCATION BELOW. THIS 700 SQFT SPACE WAS ON KIRKWOOD HIGHWAY RIGHT OUTSIDE OF ELSMERE. IT WAS A GREAT PLACE TO START, EVEN THOUGH THE PARKING WAS KIND OF CONFUSING. WE WERE THERE FROM 2009 TO 2011 THEN MOVED DOWNTOWN TO MARKET STREET! WE ROCKED OUT (LITERALLY) AT 617 N. MARKET STREET FOR A COUPLE YEARS THEN EVENTUALLY MOVED UP THE BLOCK TO 711 N. MARKET IN 2013! 711 WAS GOOD TO US, WE HAD LOTS OF FUN HOSTING COMEDY SHOWS UP UNTIL THE FIRE MARSHALL SHUT US DOWN. NOW ON TO OUR 4TH LOCATION AND WE CAN’T WAIT! Older PostSPACEBOY CLOTHING TURNS 9!